The Milky Way’s closest neighbor, Andromeda, features a dominant source of high-energy X-ray emission, but its identity was mysterious until now. As reported in a new study, NASA’s NuSTAR (Nuclear Spectroscopic Telescope Array) mission has pinpointed an object responsible for this high-energy radiation. The object, called Swift J0042.6+4112, is a possible pulsar, the dense remnant of a dead star that is highly magnetized and spinning, researchers say. This interpretation is based on its emission in high-energy X-rays, which NuSTAR is uniquely capable of measuring. The object’s spectrum is very similar to known pulsars in the Milky Way. It is likely in a binary system, in which material from a stellar companion gets pulled onto the pulsar, spewing high-energy radiation as the material heats up. “We didn’t know what it was until we looked at it with NuSTAR,” said Mihoko Yukita, lead author of a study about the object, based at Johns Hopkins University in Baltimore. 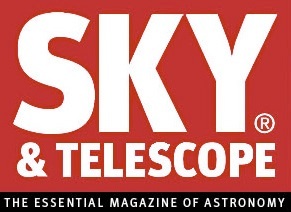 The study is published in The Astrophysical Journal. 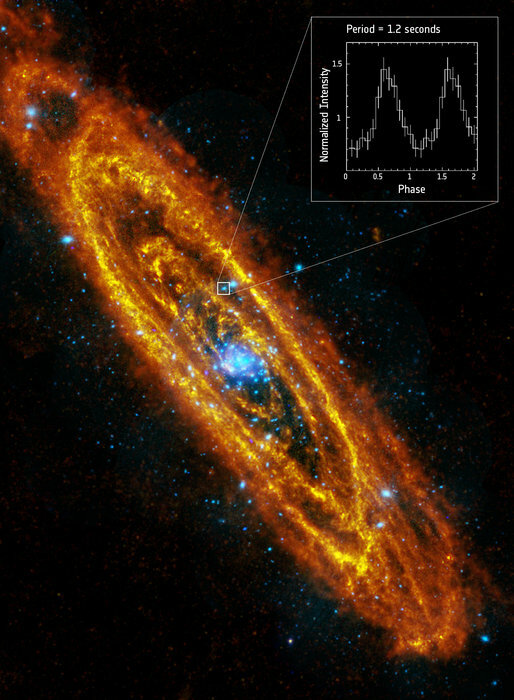 This candidate pulsar is shown as a blue dot in a NuSTAR X-ray image of Andromeda (also called M31), where the color blue is chosen to represent the highest-energy X-rays. It appears brighter in high-energy X-rays than anything else in the galaxy. The study brings together many different observations of the object from various spacecraft. In 2013, NASA’s Swift satellite reported it as a high-energy source, but its classification was unknown, as there are many objects emitting low energy X-rays in the region. The lower-energy X-ray emission from the object turns out to be a source first identified in the 1970s by NASA’s Einstein Observatory. Other spacecraft, such as NASA’s Chandra X-ray Observatory and ESA’s XMM-Newton had also detected it. However, it wasn’t until the new study by NuSTAR, aided by supporting Swift satellite data, that researchers realized it was the same object as this likely pulsar that dominates the high energy X-ray light of Andromeda. Traditionally, astronomers have thought that actively feeding black holes, which are more massive than pulsars, usually dominate the high-energy X-ray light in galaxies. As gas spirals closer and closer to the black hole in a structure called an accretion disk, this material gets heated to extremely high temperatures and gives off high-energy radiation. This pulsar, which has a lower mass than any of Andromeda’s black holes, is brighter at high energies than the galaxy’s entire black hole population. Even the supermassive black hole in the center of Andromeda does not have significant high-energy X-ray emission associated with it. It is unexpected that a single pulsar would instead be dominating the galaxy in high-energy X-ray light. “NuSTAR has made us realize the general importance of pulsar systems as X-ray-emitting components of galaxies, and the possibility that the high energy X-ray light of Andromeda is dominated by a single pulsar system only adds to this emerging picture,” said Ann Hornschemeier, co-author of the study and based at NASA’s Goddard Space Flight Center, Greenbelt, Maryland. Andromeda is a spiral galaxy slightly larger than the Milky Way. It resides 2.5 million light-years from our own galaxy, which is considered very close, given the broader scale of the universe. 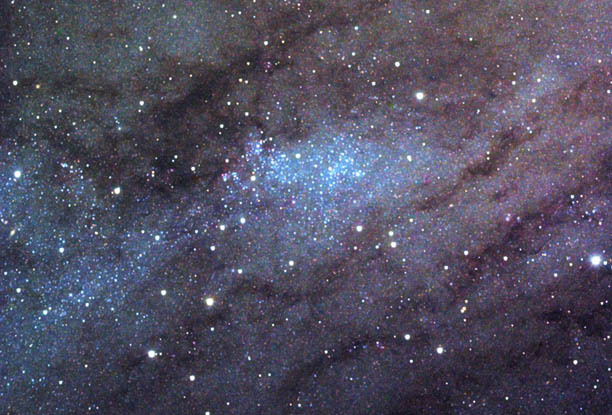 Stargazers can see Andromeda without a telescope on dark, clear nights. “Since we can’t get outside our galaxy and study it in an unbiased way, Andromeda is the closest thing we have to looking in a mirror,” Hornschemeier said. Tags: Andromeda galaxy, Astronomy ( 7,563 ), Astrophysics ( 4,698 ), Basic Research ( 10,460 ), Cosmology ( 4,889 ), Halos touching?, Science Vibe ( 4 ), Who cares? Pay your taxes. Though the merger of the Milky Way and Andromeda galaxy isn’t expected to happen for another 4 billion years, the recent discovery of a massive halo of hot, ionized gas around Andromeda may mean our galaxies are already touching. Using the Hubble Space Telescope, astrophysicist Nicholas Lehner and a team of scientists were able to identify halo at least 2 million light-years in diameter surrounding the galaxy. The Andromeda Galaxy is the largest in a collection of about 54 galaxies in the Local Group, which includes the Milky Way. With twice as many stars as the Milky Way, it shines 25% brighter and can be seen with the naked eye from rural skies. If the halo extends a million light years in our direction, our two galaxies are much closer to touching than previously thought. We may even be mingling molecules. Lehner describes the halos as the “gaseous atmospheres of galaxies.” To find and study the nearly-invisible halo, the team sought out quasars. The brightest quasar, 3C273 in Virgo, can be seen in a 6-inch telescope. Their pinpoint nature makes them the perfect probes for the job. Astronomers have observed halos around 44 other galaxies, but never one as massive as Andromeda, where so many quasars are available to clearly define its extent. The previous 44 were all extremely distant galaxies, with only a single quasar to determine halo size and structure. The halo is estimated to contain half the mass of the stars in the Andromeda galaxy itself, in the form of hot diffuse gas. Although it is mostly composed of ionized hydrogen, Andromeda’s aura is rich in heavier elements that likely come from supernovae. They erupt within the galaxy and blow iron, silicon, oxygen and other elements into space. Nearly half of all the heavy elements made by Andromeda’s stars have been expelled beyond the galaxy’s 200,000-light-year-diameter stellar disk. NASA’s Fermi Gamma-ray Space Telescope has found a signal at the center of the neighboring Andromeda galaxy that could indicate the presence of the mysterious stuff known as dark matter. The gamma-ray signal is similar to one seen by Fermi at the center of our own Milky Way galaxy. Gamma rays are the highest-energy form of light, produced by the universe’s most energetic phenomena. They’re common in galaxies like the Milky Way because cosmic rays, particles moving near the speed of light, produce gamma rays when they interact with interstellar gas clouds and starlight. NASA’s Fermi telescope has detected a gamma-ray excess at the center of the Andromeda galaxy that’s similar to a signature Fermi previously detected at the center of our own Milky Way. Watch to learn more. The gamma-ray excess (shown in yellow-white) at the heart of M31 hints at unexpected goings-on in the galaxy’s central region. Scientists think the signal could be produced by a variety of processes, including a population of pulsars or even dark matter. A paper describing the results will appear in an upcoming issue of The Astrophysical Journal. Another possible source for this emission could be a rich concentration of pulsars in M31’s center. These spinning neutron stars weigh as much as twice the mass of the sun and are among the densest objects in the universe. One teaspoon of neutron star matter would weigh a billion tons on Earth. Some pulsars emit most of their energy in gamma rays. Because M31 is 2.5 million light-years away, it’s difficult to find individual pulsars. To test whether the gamma rays are coming from these objects, scientists can apply what they know about pulsars from observations in the Milky Way to new X-ray and radio observations of Andromeda. Now that Fermi has detected a similar gamma-ray signature in both M31 and the Milky Way, scientists can use this information to solve mysteries within both galaxies. For example, M31 emits few gamma rays from its large disk, where most stars form, indicating fewer cosmic rays roaming there. Because cosmic rays are usually thought to be related to star formation, the absence of gamma rays in the outer parts of M31 suggests either that the galaxy produces cosmic rays differently, or that they can escape the galaxy more rapidly. 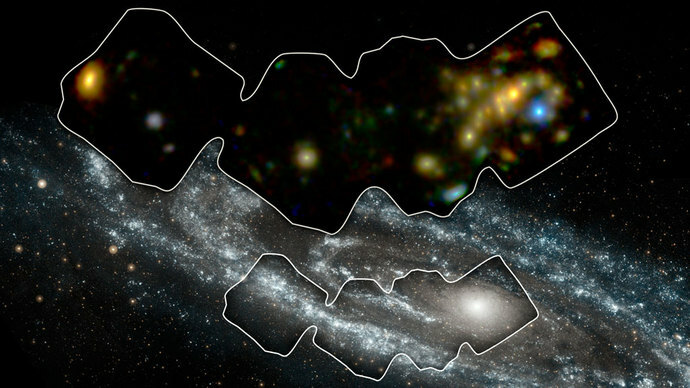 Studying Andromeda may help scientists understand the life cycle of cosmic rays and how it is connected to star formation. 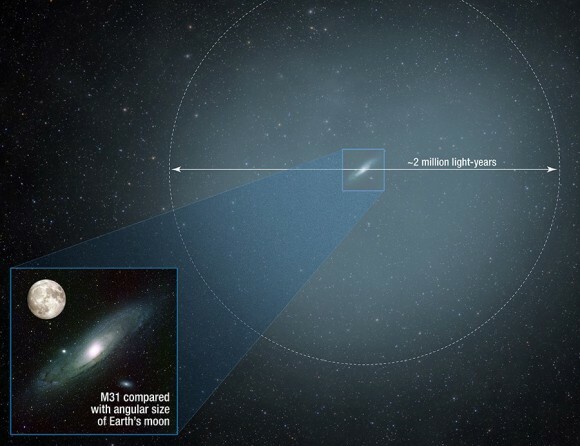 The similar discovery in both the Milky Way and M31 means scientists can use the galaxies as models for each other when making difficult observations. While Fermi can make more sensitive and detailed observations of the Milky Way’s center, its view is partially obscured by emission from the galaxy’s disk. 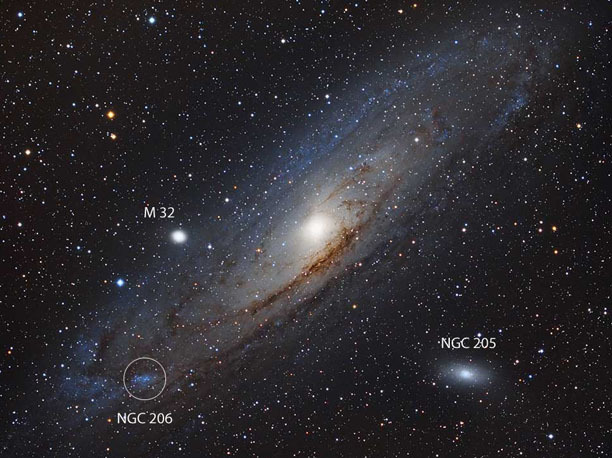 But telescopes view Andromeda from an outside vantage point impossible to attain in the Milky Way. While more observations are necessary to determine the source of the gamma-ray excess, the discovery provides an exciting starting point to learn more about both galaxies, and perhaps about the still elusive nature of dark matter. Not to be confused with our neighbouring Andromeda Galaxy, the Andromeda constellation is one of the 88 modern constellations. More importantly for this image, it is home to the pictured NGC 7640. Many different classifications are used to identify galaxies by shape and structure — NGC 7640 is a barred spiral type. These are recognisable by their spiral arms, which fan out not from a circular core, but from an elongated bar cutting through the galaxy’s centre. Our home galaxy, the Milky Way, is also a barred spiral galaxy. 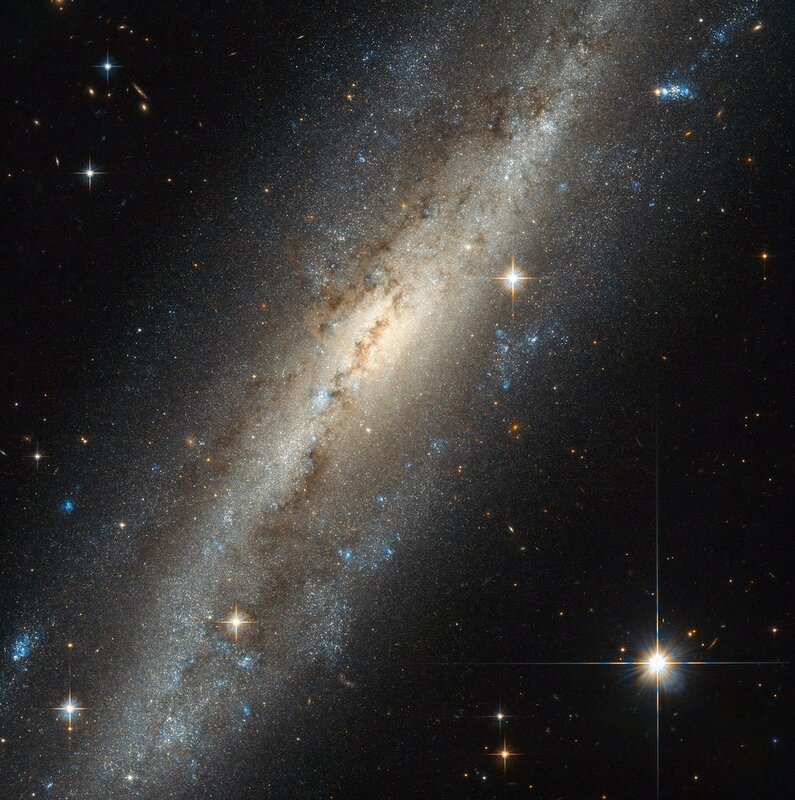 NGC 7640 might not look much like a spiral in this image, but this is due to the orientation of the galaxy with respect to Earth — or to Hubble, which acted as photographer in this case! We often do not see galaxies face on, which can make features such as spiral arms less obvious. There is evidence that NGC 7640 has experienced some kind of interaction in its past. Galaxies contain vast amounts of mass, and therefore affect one another via gravity. Sometimes these interactions can be mild, and sometimes hugely dramatic, with two or more colliding and merging into a new, bigger galaxy. Understanding the history of a galaxy, and what interactions it has experienced, helps astronomers to improve their understanding of how galaxies — and the stars within them — form. I’d like to introduce you to an interesting galaxy today. The reason it’s interesting is because it’s surprising, and in a way that caught me off guard. It’s called M98 (or NGC 4192; every object in the sky is in multiple catalogs and has multiple handles), and it’s a spiral galaxy much like the Milky Way. It’s located about 50 million light-years away, which isn’t exactly close on a cosmic scale but isn’t all that far away either. If I had to make an analogy, it’s like it’s in the next town over. We see M98 at a pretty low angle, so it appears nearly edge-on to us; spiral galaxies are pretty flat, and can have wildly different appearances depending on our viewing angle. Still, the spiral pattern is obvious enough, and you can see bright blue regions where stars are being born; those trace the arms. There is also lots of patchy dust along the arms; molecules of silica and aluminum as well as complex carbon-based molecules that are more like soot than anything else. I like the central region of the galaxy; it’s bright but from this angle is cut in half by a dust lane, distorting the apparent shape of the usually elliptical hub. All in all, it’s quite lovely, and that shot by the New Technology Telescope [NTT] really shows it off. But in that way it’s like a zillion other spirals. So what makes this one special? Unlike nearly every single other galaxy in the Universe, this one isn’t moving away from us. It’s moving toward us. There’s no danger of a collision! At its speed of 150 km/sec, it would take a hundred billion years to get here, so don’t wait up. Also, it’s probably not heading directly at us, because it’s part of the Virgo Cluster, a grouping of about thousand galaxies bound by their own gravity. It’s the closest true cluster to us, and our own small Local Group of a couple dozen galaxies is like a small town near a bigger one. M98 is part of the Virgo Cluster, so it’s in orbit around the cluster center. We’re way outside the cluster, so it can’t hit us. Here’s the fun bit. The Universe, as you may know, is expanding. One way to think of it is that space itself is getting bigger, and as it does galaxies are swept along with it. Galaxies aren’t really moving away from each other, they’re just floating along with the local flow. But in many ways it’s like they really are moving away. One way is that their light is redshifted; the wavelength of the light they emit is stretched (it’s very similar to the Doppler effect that makes a motorcycle go EEEEEEeoowwwwwww as it passes you, changing the pitch of the noise). Practically every galaxy in the Universe shows this redshift, and in fact that’s how all this was discovered in the first place. The farther away a galaxy is, the more it’s light is shifted. But not every galaxy shows it. Close by galaxies have much lower redshifts, and if the galaxy itself is moving rapidly through space (and not just with it), that local velocity will get added to or subtracted from the recession velocity. One example of this is the monstrous Andromeda galaxy, which is headed toward us at high speed. We actually will collide with it, though not for quite some time (like, 4 billion years). But it shows a distinct blueshift in its light; it’s moving around faster than space is expanding. M98 is doing the same thing. That surprised me when I saw it in a catalog; it’s far enough away that the Universal expansion should make it recede from us at about 1,000 km/sec. But then I saw it was in the Virgo Cluster, and I understood. The massive gravity of all those galaxies means they orbit the center at a decent clip, so some galaxies are redshifted more than average as they head away from us, in the part of their orbit taking them to the other side of the cluster. Some have lower velocities because they’re headed toward us in their orbits. But M98 is still unusual because it can completely overcome the recession of the cluster, and actually be physically headed toward us. That’s almost certainly because it’s recently interacted with another galaxy in the cluster; when galaxies pass each other one can be flung away at high speed, something like a slingshot effect. M98 may very well have done this, and that’s why it’s blueshifted, not redshifted. As you look to more distant clusters this gets rare or nonexistent, because at that distance the cosmic expansion dominates, and it doesn’t matter how fast the galaxy is moving: It can’t overcome that recession. All galaxies past a certain distance are redshifted, which is yet another reason (among many, many others) that we know the Universe actually is expanding. That’s pretty cool. I like surprises when I’m reading up on lovely astronomical objects; that means I’ve learned something. M98 is headed toward us, a rare blueshifted galaxy. Huh. That just adds to its beauty and intrigue to me. It’s a really beautiful Universe, and it’s also a really interesting one. I’d say that’s its best quality. Slate is a daily magazine on the Web. Founded in 1996, we are a general-interest publication offering analysis and commentary about politics, news, business, technology, and culture. Slate’s strong editorial voice and witty take on current events have been recognized with numerous awards, including the National Magazine Award for General Excellence Online. The site, which is owned by Graham Holdings Company, does not charge for access and is supported by advertising revenues. The Hubble Space Telescope easily resolves millions of individual stars in an outer region of the Andromeda Galaxy, also known as M31. I always figured I’d have to wait until the next supernova to see an individual star among the trillion that comprise the Andromeda Galaxy. At the galaxy’s distance of 2.5 million light-years, the stars blend into a luminous stellar fog. Whenever I show Andromeda to the public, I make sure to remind each viewer that the haze they see is actually the light of billions of individual stars too far and faint to resolve into individual pinpoints. In binoculars and small telescopes, it’s easy to distinguish the core, where stars are more strongly concentrated, from the less populated arms. Those with 10-inch and larger telescopes can survey the galaxy’s brighter globular star clusters and stellar associations with the aid of detailed maps. But individual stars? Several years back, I briefly observed a bright nova just outside the galaxy’s nucleus in my 15-inch reflector when it peaked around magnitude +14.9. That was a lucky break as most novae in M31 max out around magnitude +17-19 and require telescopes upwards of 20-inches to track down. In this wide-field photo of the Andromeda Galaxy, the bright OB association NGC 206 resembles its visual appearance. The massive star cloud is located at the southwestern end of the galaxy’s disk at the junction of two spiral arms. Then one fall night, while hunting down globulars and other minute delights in the galaxy, I shifted the scope to NGC 206, M31’s largest and brightest star cloud. 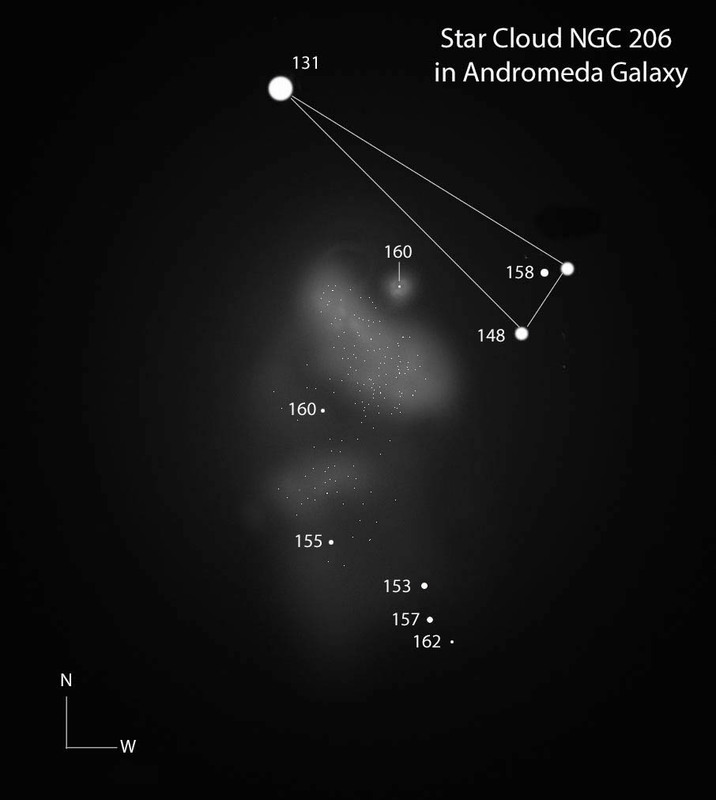 The object, which resembles a weakly condensed 10th-magnitude comet superimposed on Andromeda’s southwestern arm, measures 4.2′ across. Its true size is about 4,000 light-years across or nearly three times the distance from Earth to the star Deneb in the Northern Cross, making it one of the largest star clouds in the Local Group of galaxies. If you haven’t observed it yet, you’ve probably noticed this distinctive hazy patch in photos of Andromeda. NGC 206 also goes by the name OB 78 and resembles the vast Perseus OB 1 association which includes Mirfak, the brightest star in Perseus, and the popular Double Cluster. OB associations, named after the brilliant class O and B stars they contain, are loosely organized gaggles of young stars and star clusters born in the collapse of a giant molecular cloud. True star clusters, more compact by nature, keep hold of their stars through gravitational attraction. Thinly spread OB associations make easy prey for galactic tides, which pull associations apart and disperse their members far and wide. NGC 206 is home to some 300 brilliant blue stars, the youngest of which are just 10 million years old, incredibly young by stellar standards. Stars 20 times more massive than the Sun are common with a few topping out at more than 40x solar! Inspired by these superlatives and photos that showed good resolution of the cloud, I cranked up the magnification to 242x and then 357x, allowed my eyes to fully adapt to the darkened field of view and got the surprise of my life. Stars! NGC 206 appeared in three sections: a tiny ~30″ wide knot dotted by a 16th magnitude star, a brighter, clumpy northern “cloud” and a fainter, more distended southern section separated by a relatively haze-free gap (in other words, no unresolved stars). 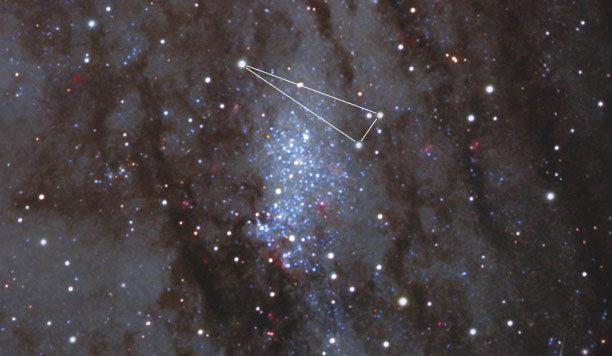 Direct vision revealed several faint stellar points around and within the cluster, some of which were members of the association and not Milky Way foreground suns. NGC 206 lies at the intersection of two of Andromeda’s spiral arms and was likely spawned in a collision of massive dust clouds at their intersection. But the thing that positively electrified the view was seeing OB 78 materialize into a rich spray of barely visible stars with averted vision. They came and went with the vagaries of my eye’s position and seeing conditions, but there was no question I was seeing cluster stars based on location and star density compared to the ambient Milky Way foreground. The scene reminded me of the grainy interiors of the remote globular clusters NGC 7006 in Delphinus and the “Intergalactic Wanderer,” NGC 2419, in Lynx. In all three cases, it was next to impossible to hold so many faint stars in view long enough to see them individually or connect them into patterns. Instead, they appeared as a granulated haze or mist of dim points that flashed in and out of view. Stephen Odewahn of the McDonald Observatory surveyed NGC 206 in the 1980s and published a photometric survey of its brightest stars. While most are hopelessly faint for visual observers even with moderately large telescopes, 14 members range between magnitude +14.8 and +17.5, making them somewhat less hopelessly faint. A 15-inch scope covers the brighter end of that range with ease, but the number of stars I glimpsed with averted vision implies that in some situations, based on seeing, magnification and experience, we can momentarily best a telescope’s limiting magnitude by a surprising margin. No one should be content with a single observation of faint nothings, so I re-observed the star cloud on several occasions and confirmed my observation using friends’ 18-inch and 24-inch telescopes. We invited several members of our clubs to view NGC 206 and every one of them was able to at least partially resolve the stellar association in each scope. Using a photo labeled with some of the brighter stars from Odewahn’s paper, I was able to clearly see and identify seven stars between magnitudes +14.8 and +15.8 in the 15-inch. I’ve included these in a drawing made using Photoshop that I hope will provide a useful tracking guide for your own explorations. While a 24-inch scope reveals even more stars, a 15-inch scope is easily up to the task of breaking out some of Andromeda’s brightest blue supergiant stars from this magnificent clutch of stellar celebrities. Daring amateurs may even want to put a 10 or 12-inch scope to the task. I’d love to know what you’ll see. The Milky Way’s plane obscures our view of most stars in our own galaxy, but an even grander spiral — Andromeda — lies 2.5 million light years away. A Mosaic of the 117 million resolved stars — plus many more unresolved ones — in the disk of the Andromeda galaxy. Image credit: NASA, ESA, J. Dalcanton, B.F. Williams, L.C. Johnson (University of Washington), the PHAT team, and R. Gendler. Even at this modest distance, incredible telescope and camera technology is needed to resolve individual stars in a galaxy beyond our own. 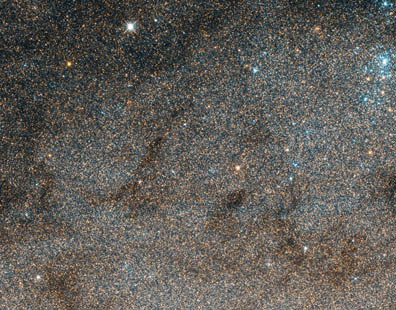 The Hubble Space Telescope recently completed the Panchromatic Hubble Andromeda Treasury, mapping a third of Andromeda’s disk and resolving over 117 million individual stars. Closeup of a large region of the Andromeda galaxy’s disk, containing hundreds of open star clusters (identifiable as bright blue sparkles). Image credit: NASA, ESA, J. Dalcanton, B.F. Williams, L.C. Johnson (University of Washington), the PHAT team, and R. Gendler. Six of the most spectacular star clusters in Andromeda. The brilliant red star in the fifth image is actually a foreground star in the Milky Way. Over a thousand new clusters were found in this survey. Image Credit: NASA, ESA, and Z. Levay (STScI); Science Credit: NASA, ESA, J. Dalcanton, B.F. Williams, L.C. Johnson (University of Washington), and the PHAT team. Far outside of the center, in the outer disk and the faint galactic halo, a different set of populations thrive. Image credit: NASA, ESA and T.M. Brown (STScI), of the stars in Andromeda’s outer disc. The outer disc of Andromeda (above) shows a wide variety of stars, including many Sun-like ones and older variables. Image credit: NASA, ESA and T.M. Brown (STScI), of the stars in Andromeda’s giant stellar stream. The Milky Way’s foreground stars are clearly identified by their diffraction spikes. The stars from the giant stellar stream are also densely packed, obscuring the Universe beyond. While the diffuse halo’s low-density regions contain many of the oldest, least evolved stars. They’re lower in heavy elements than any stars found in the disk, with galaxies up to billions of light years away visible through the gaps in the halo stars. Andromeda, or [Messier] 31, is a popular target among astronomers. Under clear, dark skies it is even visible to the naked eye. Its proximity and similarity in structure to our own spiral galaxy, the Milky Way, make it an important natural laboratory for astronomers. It has been extensively studied for decades by telescopes covering the whole electromagnetic spectrum. These pulsars can be found in stellar couples, with the neutron star cannibalising its neighbour. This can lead to the neutron star spinning faster, and to pulses of high-energy X-rays from hot gas being funnelled down magnetic fields on to the neutron star. 6Department of Physics and Astronomy, University of Leicester, Leicester LE1 7RH, U.K.
NASA’s Nuclear Spectroscopic Telescope Array, or NuSTAR, has captured the best high-energy X-ray view yet of a portion of our nearest large, neighboring galaxy, Andromeda. The space mission has observed 40 X-ray binaries — intense sources of X-rays comprised of a black hole or neutron star that feeds off a stellar companion. The results will ultimately help researchers better understand the role of X-ray binaries in the evolution of our universe. According to astronomers, these energetic objects may play a critical role in heating the intergalactic bath of gas in which the very first galaxies formed. Other space missions, such as NASA’s Chandra X-ray Observatory, have obtained crisper images of Andromeda at lower X-ray energies than the high-energy X-rays detected by NuSTAR. The combination of Chandra and NuSTAR provides astronomers with a powerful tool for narrowing in on the nature of the X-ray binaries in spiral galaxies. In X-ray binaries, one member is always a dead star or remnant formed from the explosion of what was once a star much more massive than the sun. Depending on the mass and other properties of the original giant star, the explosion may produce either a black hole or neutron star. Under the right circumstances, material from the companion star can “spill over” its outermost edges and then be caught by the gravity of the black hole or neutron star. As the material falls in, it is heated to blazingly high temperatures, releasing a huge amount of X-rays. With NuSTAR’s new view of a swath of Andromeda, Wik and colleagues are working on identifying the fraction of X-ray binaries harboring black holes versus neutron stars. That research will help them understand the population as a whole. “We have come to realize in the past few years that it is likely the lower-mass remnants of normal stellar evolution, the black holes and neutron stars, may play a crucial role in heating of the intergalactic gas at very early times in the universe, around the cosmic dawn,” said Ann Hornschemeier of NASA Goddard, the principal investigator of the NuSTAR Andromeda studies. Harrison will be presenting the 2015 Rossi Prize lecture at the AAS meeting. The prize, awarded by the AAS’s High-Energy Astrophysics Division, honors physicist Bruno Rossi, an authority on cosmic-ray physics and a pioneer in the field of X-ray astronomy.